Achieving a toned and firm midsection is just as challenging for men as it is for women. For some men, no amount of time spent at the gym is enough to provide them with the sculpted, firm, and slim abdominal contour they desire. Weight fluctuations, age, and genetics all factor into the quality and appearance of your abdomen. 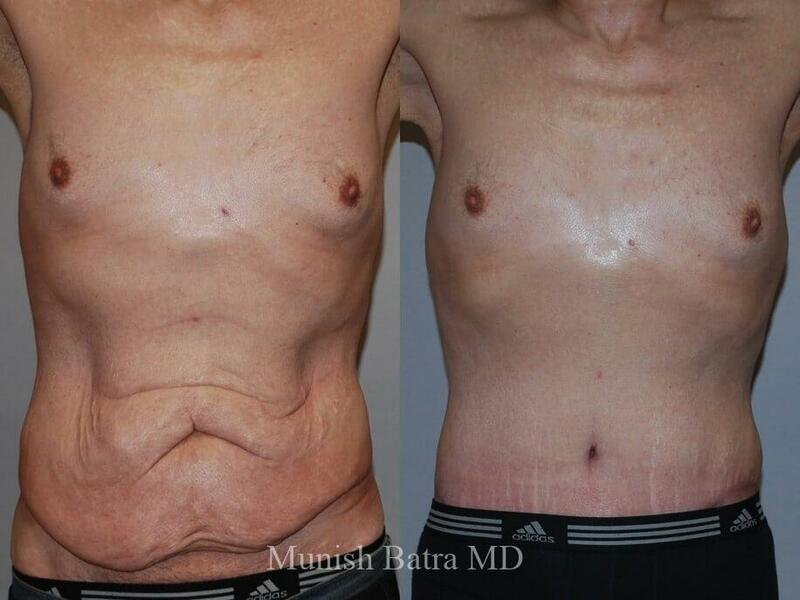 If you are tired of fighting against these factors, then male tummy tuck surgery can help to enhance the appearance of a weak midsection by removing excess skin, tightening the underlying rectus muscles, and removing excess pockets of fat, if necessary. At Coastal Plastic Surgeons, Dr. Batra offers many versions of the tummy tuck, and each procedure is customized to your desired level of abdominal correction. Achieve a toned physique and enhance your confidence with a tummy tuck. What Can Male Tummy Tuck Achieve? For many men, one of the hallmarks of a masculine physique is a slim midsection with noticeable definition. Tummy tuck surgery removes excess skin to provide you with a toned stomach that no amount of crunches or cardio can achieve. Feel confident in your masculine figure both with a shirt on and without. Having toned abdominal muscles is a common desire amongst men; however, even for men who regularly work out, it’s not an easy accomplishment. Weight loss and the normal progression of aging can leave the abdominal muscles looking and feeling weak. However, tummy tuck surgery repairs the rectus muscles to result in a toned core. For men, excess fat often accumulates in the abdomen and flanks, which leads to a less-than-desirable physique. Dr. Batra often performs liposuction of the abdomen in conjunction with tummy tuck surgery to not only remove the excess skin and firm the abdominal muscles but to also remove the stubborn pockets of fat that are standing between you and the toned contour you desire. A traditional, full tummy tuck is ideal for men experiencing skin and muscle laxity with localized pockets of fat in the lower abdomen. The incision for a full tummy tuck is made from hip bone to hip bone in the lower abdomen, allowing for easy concealment. An additional incision is made around the belly button, as a new belly button is usually created with this technique. Through these incisions, weakened rectus muscles are tightened, and excess skin is trimmed away. For men who require less correction of the abdomen, a mini tummy tuck may be all that is necessary for them to reach their desired results. While a mini tummy tuck will not reach the same level of correction as the traditional tummy tuck, the excess skin below the navel is still removed, and weakened abdominal muscles are repaired. This variation does not alter the belly button and is performed through a smaller incision made in the lower abdomen. This shorter incision allows for a quicker and more comfortable recovery. Men who have lost a substantial amount of weight are surprised to find excess skin not only on the abdomen but also around the hips, thighs, and lower back. An extended tummy tuck removes excess skin around the body using a circumferential incision at the midsection. From here, weakened abdominal muscles are repaired, and excess fat is often removed from the abdomen, hips, and lower back. Traditionally, the belly button isn’t altered through this incision; however, it may be altered depending on the amount of excess skin present. With this technique, men experience a complete midsection makeover. The recovery time frame of your tummy tuck will depend significantly on the type of tummy tuck you undergo. During the initial weeks following your surgery, a compression garment will be worn over the abdomen at all times to reduce swelling, increase blood circulation, prevent blood clots, and promote healing. Patients should attempt to get on their feet as soon as possible for leisurely walks. Most patients return to work after two weeks depending on the nature of their job; however, all strenuous exercise, activity, and heavy lifting should be avoided for at least six weeks to eight weeks. Tummy tuck surgery is performed under general anesthesia to prevent any pain during the procedure. Afterward, you may experience bruising, swelling, tightness, and some pain. Medication is prescribed to remedy any discomfort. These symptoms should disappear after a few weeks. While Dr. Batra makes the incisions as inconspicuous as possible, scars will be present at the incision sites. Patients can reduce the appearance of this scarring by minimizing sun exposure and tension on the incisions. All scarring will likely fade with time. Your tummy tuck cost depends on many factors including the type of tummy tuck chosen and techniques used as well as anesthesia fees, surgical fees, facility fees, and location. Dr. Batra and his staff will provide you with a detailed price quote during your consultation. Is liposuction combined with my tummy tuck? Liposuction will most likely be performed in conjunction with your tummy tuck to get rid of the localized pockets of fat in the abdomen. Liposuction can be combined with any tummy tuck variation to slim and tone the abdominal contours. When can I expect to see my results, and will they be permanent? It can take up to several months for all residual swelling to disappear. Your results will be long lasting assuming that a healthy lifestyle is maintained. Any future weight gain may alter the look and quality of your results. What are the procedural steps? On the day of your surgery, you will be placed under general anesthesia (it is for this reason that you will need a companion to drive you home and stay with you for the first day). 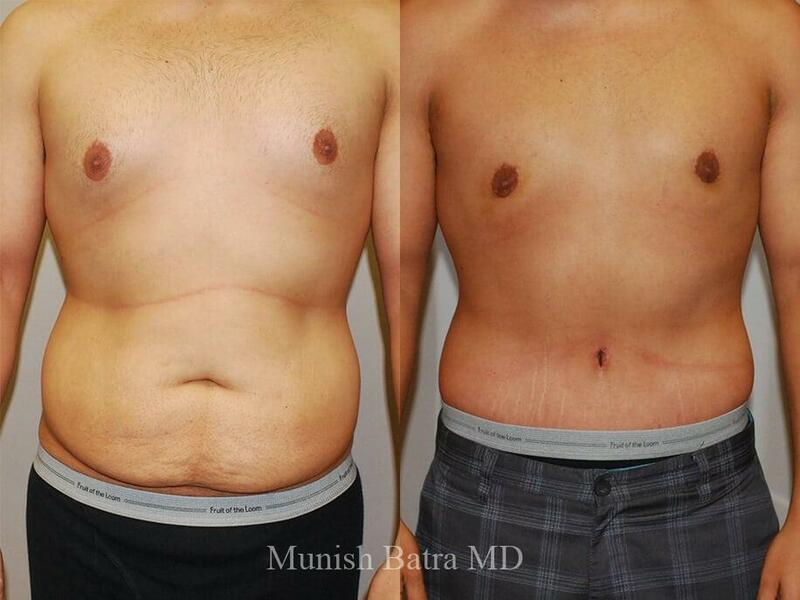 Once you are asleep, Dr. Batra will make the incision that correlates with the tummy tuck technique that you are undergoing. From here, the skin will be separated from the abdominal wall, the muscles will be tightened, and the skin will be redraped and trimmed. If liposuction is being combined with the tummy tuck, then liposuction will be performed before the incisions are closed. Dr. Batra has over 20 years of experience in body sculpting procedures. With local and worldwide respect, Dr. Batra has the knowledge, training, and expertise to ensure that you receive the best possible care for optimal results.